Sandra Markle's third book in the Scientific Mystery series is just as engrossing as The Case of the Vanishing Golden Frogs and The Case of the Vanishing Honey Bees. In The Case of the Vanishing Little Brown Bats readers are introduced to a problem: bats are mysteriously dying. Scientists have discovered the bodies of bats on the floors of caves in the northeastern United States. The book is organized in a question & answer format will will keep readers engaged. Markle poses various questions then shows how scientists tested each theory. "Could climate change be the problem?" "Could pesticides be the killer?" As each question is answered, readers learn about the physical features of bats, their habitats, and the importance of bats to the ecosystem. Photographs throughout the book show scientists at work in labs, observing bats in caves, downloading data from computers, and swabbing bats to test for bacteria and fungus. The length of the book, layout of the pages, size of the print, and writing style make this an ideal book for middle grade readers who are not quite ready to tackle the more complex Scientist in the Field series. 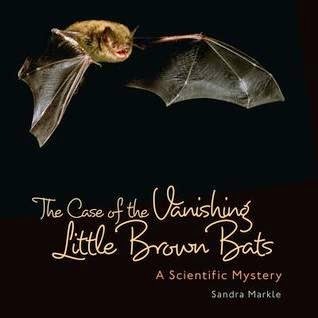 The Case of the Vanishing Little Brown Bats could serve as an excellent, nonfiction read aloud for grades four and up. Not only does the book encourage kids to see problems through the eyes of scientists, but it also will motivate readers to protect bats in their own backyard. Back matter includes an author's note, glossary, tips for helping bats, and a list of global efforts to protect bats. Visit the Lerner Publishing site to look inside the book. Read Sandra Markle's blog post about bats. I loved this book! Glad to see you feature it.